I don’t pretend to be a great ‘foodie’ but I just thought I’d share this quick and super easy, and tasty, take on some very ordinary veggies. You can use any veggies you like but I prefer traditional potato, sweet potato, carrots and pumpkin for a good base. Spray a large baking tray with olive oil. I use Moro Extra Virgin Olive Oil as it has a lovely clean and light taste. Peel and cut the root veggies into large chunks, and halve the bigger sprouts otherwise leave whole, and if using cauliflower or broccoli break into large florets. Boil in lightly salted water for about five minutes; drain and spread onto the baking tray. Then comes the tasty bit … sprinkle the veggies with spice mix (be very generous) and drizzle with olive oil. 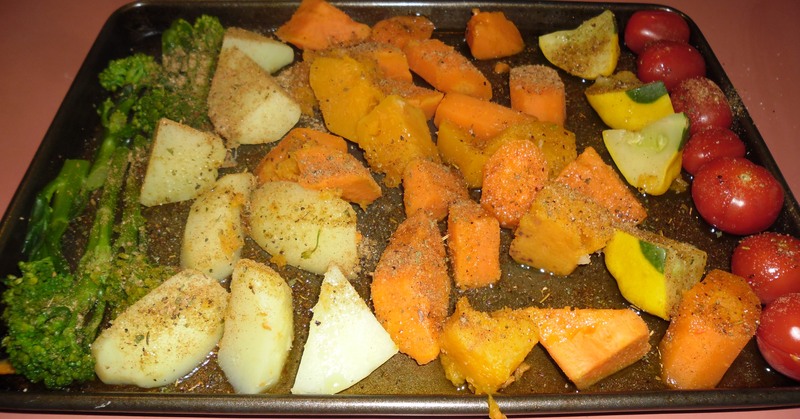 Bake in preheated oven (200 degrees) for 20 minutes and serve as a side dish with just about anything! Here are few of my favourites. I used Jamie Oliver’s lemon and thyme butterflied lamb and cooked in the slow cooker for 6 hours. Delish! You can also do the same veggies sprinkled with Indian spices, and serve with samosas for a yummy vegetarian. 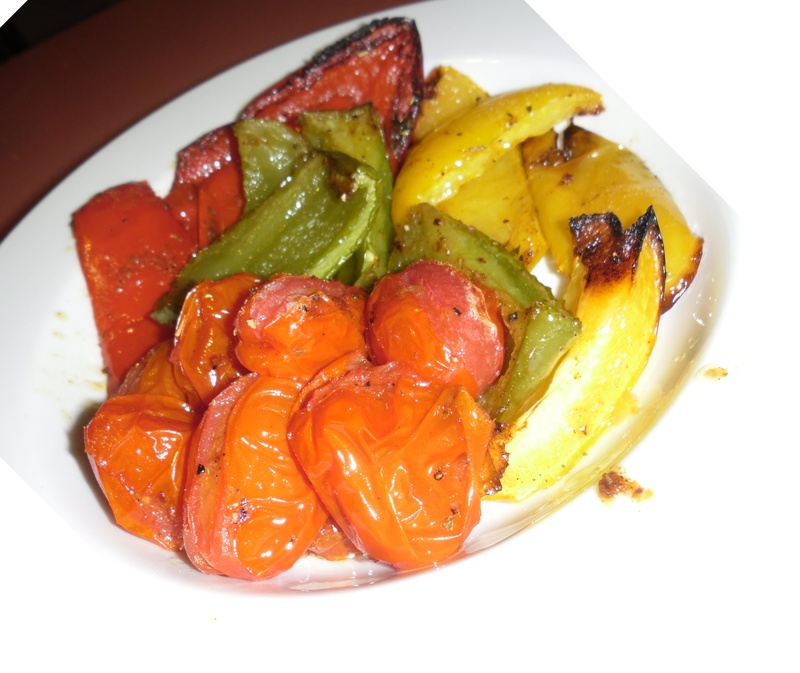 Or try red, yellow and green peppers cut into large pieces (no need to precook) and baby Roma tomatoes—just make a cut in the tomatoes so they don’t burst, and drizzle with olive oil and a good sprinkle of Italian herbs and spices, and bake for 20 minutes or until soft. 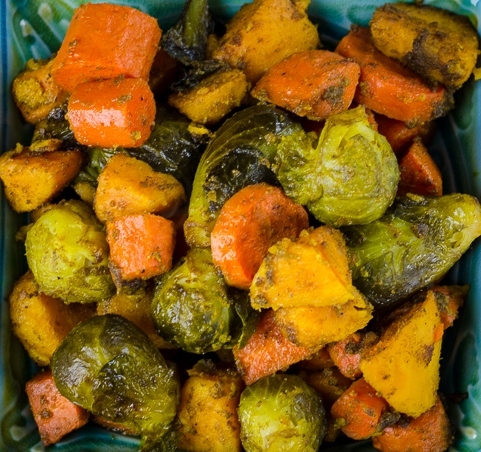 Makes a great side dish for any Italian meal. If I can do it—you certainly can! And don’t forget, you can get the best and freshest veggies every Saturday from Canberra Region Farmer’s Market at EPIC. This entry was posted in LFW Food&Wine and tagged Australian Bush Spices, Canberra Region Farmers Market, Jamie Oliver, Moro Olive Oil on October 30, 2014 by gracienumber1.